The Potsdam Sandstone is composed of tiny quartz (SiO2) grains that are held together by quartz cement. The result is a very hard, compact and weather-resistant rock. Smash a piece and the fracture will cut across both the cement and individual sand grains. Such well-cemented, pure quartz sandstones are called orthoquartzites by geologists, even though the rock is of sedimentary origin. Hammer-welding amateurs find the sandstone hard to trim because the slabs often break in unpredictable directions. Smooth-sided slabs, however, can be extracted from an outcrop with hammers, crowbars or a front end loader if the breakage occurs along bedding planes and cross joints. The thin slabs used for patio floors and sidewalks are taken from surface exposures (Fig. 9), whereas the thicker blocks used for building stone generally occur at depth in the quarries. The qualities of Potsdam sandstone were highly praised in the 1850s, especially the red to pink stone available at Hannawa Falls. It was durable and not as susceptible to spalling in fire as was the case with certain New England granites. The sandstone was widely used, early on, as a lining for charcoal-fueled iron furnaces in New York State and Ontario. Various appraisers had called attention to the sharpness of outline in natural exposures that had lasted “several centuries” (no appreciation of geologic time here). The stone was said to occur in even-bedded strata and to cleave into slabs with flat faces and straight edges. There was nothing in the rock to “nourish parasitical mosses.” Walls made from this siliceous material, it was claimed, did not become moldy and smell of decay as did limestone walls in damp basements. The sandstone kept its color, and the claim was made that exposure to air actually hardened it. The claim is questionable, given the impermeability of the rock to moisture. Perhaps the hardness of the silica cement was noticed once the broken and loosened quartz grains were brushed away. The Potsdam Sandstone varies throughout the North Country from gray to tan, rusty yellow and pink to red. The color originates from tiny amounts of iron oxide stain in the cement—either yellow-brown goethite FeO(OH), (pronounced ger-tite) or reddish hematite, Fe2O3. Upwardly in the stratigraphic sequence, the cement varies from quartz to “lime,” a powdery form of the mineral calcite. CaCO3. The soft carbonate mineral dissolves in mildly acid rainwater. Lime-cemented sandstone, thus, is not the best building stone; it may be thin bedded and readily decomposed by weathering. The strata grade upwardly from quartz sandstone to sandy limestone and strictly limestone and/or dolomite. Somewhere, abruptly in that vertical transition, geologists have defined a second rock unit called the Theresa Formation (Fig. 2). The Potsdam and Theresa formations were deposited when marine waters began to encroach (transgress) upon the continent. The sea moved slowly from southeast to northwest, flooding the low hills of crystalline bedrock in northern New York and southern Ontario. Rivers located on the western continental shoreline flowed into the shallow sea and deposited sprawling deltas of sand. Long shore currents moved the sand up and down the shore, creating beaches that glistened like silvery ribbons. Offshore to the east, the warm sea water was clouded with chalk-like precipitates of lime that settled to the bottom. As the sea moved inland (northwest), the Potsdam beach sands were submerged under deeper water to become buried by the lime-bearing Theresa Formation. Consolidated rocks made from these sediments become younger from bottom to top and slightly older from southeast to northwest. For example, the basal sandstone at Westport Village on Lake Champlain is older than basal sandstone here at Potsdam where it was first named and quarried. This transgression of the sea occurred during the transition from late Cambrian into the early Ordovician Period, about 500 million years ago. Sedimentation continued through later geological periods until thousands of feet of rocks were deposited. 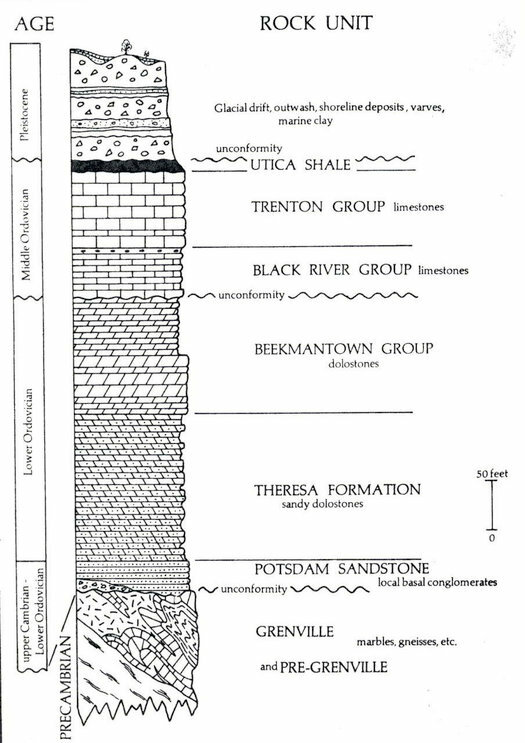 Sedimentary strata once covered northern New York State but were eroded from the Adirondack Dome and preserved chiefly in the southern and western parts of the state.